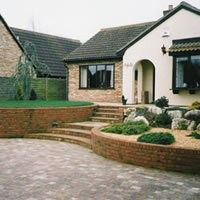 Front garden situated in Radwell, Bedfordshire. Complete re-design of the front garden consisting of new steps, retaining walls, rockery, aggregate areas and block paving of the driveway. 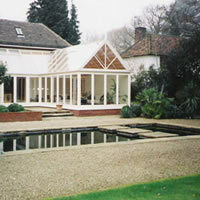 Rear garden situated in Harpenden, Hertfordshire. Complete re-design of the rear garden consisting of a new terrace area, large Koi pond, aggregate area, deck, new planting beds and lawn. 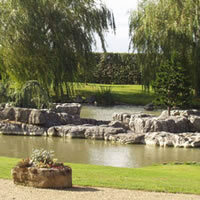 Installation of a rock island into an existing pond in Meppershall, Bedfordshire. Complete re- design of a rear garden situated in Ashwell, Hertfordshire.The garden sloped from the top boundary down to the terrace area. We used the slope to create three main levels linking into the existing steps situated at the top end of the garden.The main terrace area of natural Indian sandstone paving was created on the lowest level. 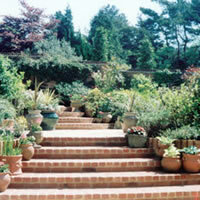 The middle level incorporates a circular lawn area to create shape and add width to the garden. 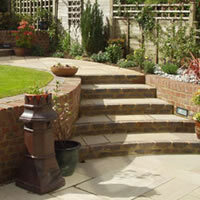 Curved steps and a pathway link all three levels together allowing a much easier access to all areas of the garden. 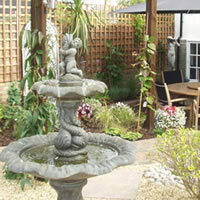 The construction of a rear garden situated in Ashwell, Hertfordshire. Before, during and after photos. Random images of other jobs plus a front cover from the Landscaper magazine featuring the garden we built at Hampton Court Flower Show in 2007 for the Association Of British Conifer Growers.